In an effort to enhance transparency and customer service, the Austin Code Department has partnered with Civic Industries, LLC to launch the innovative online dashboard you see below. This dashboard will update, alert, and inform you about code cases in your neighborhood. This tool will access our case management system, and provide the current status of cases around Austin, which will update daily. 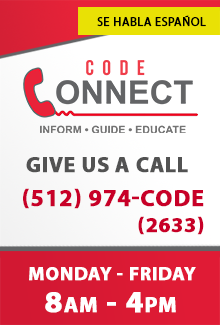 Code Connect is a program that allows residents to contact the Austin Code Department and talk to an experienced code inspector who can help with general code questions, provide resource guidance, and give updates on existing cases. Give us a call at (512) 974-CODE (2633).